CPUMINER-SLEEPY is a modified version from the original version of CPUMINER-MULTI. With it, you will get a very low CPU usage. The normal cpuminer-multi with 1 thread gives ~1600kH/sec. The normal cpuminer-sleepy with 1 thread and sleepy by default (1) gives ~150kH/sec. The cpu usage is pretty low and even really bad cooling computer can run it! The zipfile contains windows 64 and windows 32 version. Some DLL files are provided with the zipfile. I don't know if they are really necessary. Depending of your system. 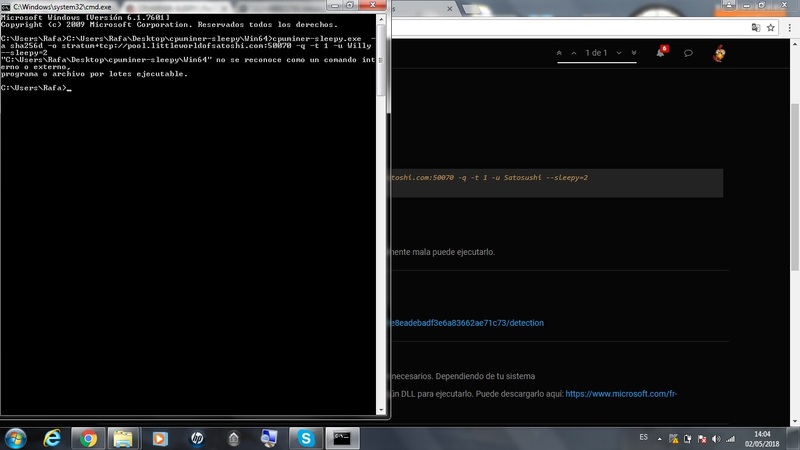 The text in Spanish says: "it is not recognized as an internal or external command, program or executable batch file". With your file explorer, go into the directory where cpuminer-sleepy is. Then, in the address bar of the file explorer, type "cmd"